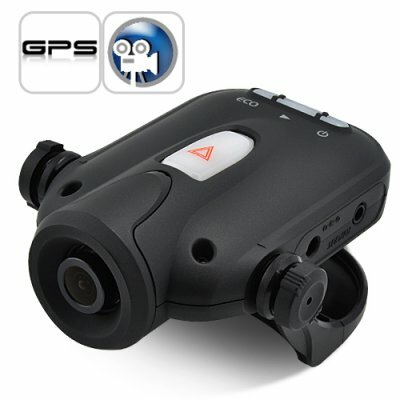 Successfully Added Eyes Wide Open - GPS Car DVR (8GB) to your Shopping Cart. A GPS driving recorder taking video, audio and GPS data from your car to monitor the road while you focus on driving! Sharing your car is a hard choice? Trusting your employees who need to travel a lot too? Did you ever think of having your eyes beside the driver without being physically there? This device will make your wish real! Installed discreetly near the windshield thanks to its convenient dimensions it will record everything happening in front of it when the engine is on. It is a real-time recorder along with a G-sensor detecting any motion changes in X, Y and Z axis. As soon as any sharp braking, rapid acceleration, excessive cornering or sudden impact occurs, it will automatically see it and save a time period from 10 seconds before the event to 20 after! Then you will be able to review it as often as needed. A definite advantage to get your money back from your insurance company! A very good quality resolution will help you to notice every detail (even the fly crashing into your windshield or bombing your paint with a metallic finish hood of its viscid substance). With its huge internal memory of 8GB it can also store countless hours of road, vehicles and landscape! What more? If you decide to record any interesting things on your own just simply press the manual recording button. Thanks to the pre-record function, you can even press the button and record video up 10 seconds after something has caught your attention - a great feature in case you missed a sign! Moreover if you get in an accident and need to clarify immediately what has just happened you can connect the device directly to a video player via an AV cable. It is very useful to get indemnified instantly for small cases. Once it is time to check and analyze all stored data you have two methods. Either you connect the recorder directly to your computer or use a flash drive (up to 8GB) to transfer data. There's no need for software installation, so just plug and play to view all your files. If you want to save some videos on your hard disk you can convert them into any format - there are no compatibility worries! It also simultaneously shows GPS information such as vehicle location on Google map, speed, time and date. As great as this! You claim to be a professional driver but nobody believes you? What if this item could prove your words? A single LED color indicator will constantly inform you about your driving performance. If you are always in the green (which means you have economical fuel consumption) you will gain trust from your passengers. However if the light remains red I advise you to get out of the car! So if you are teaching people how to drive this can be an attractive feature for you. Otherwise it will help you evaluate the driving of your relatives and friends! Do not wait to equip your car with this gadget as it will make you feel more relaxed while you are driving! And this is brought to you at a great price by the online leader in China wholesale electronic products - Chinavasion. Excellent video quality by using H.264 video encoding format. If you watch videos with popular players such as Windows Media Player please make sure you have the appropriate codec. It is possible to capture and print an incident by selecting images from videos with the provided software. Can I check the location of my car in motion with a computer from my home or office? No you can only check recorded data with the software that is included.